For the fourth year in a row, the Packers have the youngest 53 man roster, and after a stellar preseason, some are pushing the panic button and pointing to the youth as a liability. And this could be true without proper leadership. But if you have a couple of solid veterans to set the tone for the youth around them, inexperience can be turned into an asset. And the Packers have two such veterans, one on each side of the ball. One was a 7th-round miracle story, the other a Heisman-winning top-five draft pick. Where one spikes the ball and leaps into the stands (above left), the other places the ball on the ground (above right) and blends into the sideline. Offense vs. defense, McDonalds vs. fine wine (seriously), they're really opposites in every way. 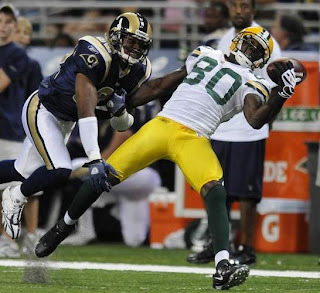 But Donald Driver and Charles Woodson have become the faces of their respective units this year. Defensive Player of the Month to start the season. Not bad. Plenty is made about Woodson's ballhawking ability, but he's really the most complete football player on the defense. In the upcoming Packers-Vikings game, pay attention to Woodson when he makes a tackle. No one is better in the open field when taking down a runner. He takes smart angles, keeps his feet, and rips and pounds at the ball until the whistle blows. And he does all of this like a true pro. He seems to approach football as a job--one he's damn good at, and one he takes very seriously. There's a lot of talent on the defensive side of the ball, and it's easy for talented players to get upset about not getting enough opportunities (see Barnett, Nick). Because of this, its important that the leader of the defense promote a team-first attitude, and Woodson is setting an excellent example for the youth on his end of the ball. First off, Driver is flat out an athlete. He was a track star in college and works a Jerry Rice-like offseason regimen. But that off-kilter, left-handed catch with a Ram locked on his right arm was all desire. And he makes plays with that kind of desire every game. Whether the route is a screen, sends him over the middle, or takes him deep one-on-one with a corner, Driver not only makes the catch, but tries for the extra yard. He rarely settles for what's given to him, and he always bounces up smiling and celebrating. This year, thanks to a struggling offensive line, this mentality would be a good one for the offense to adopt. Rodgers will continue to find himself running for his life, and Grant will need to cut back or bounce to the outside more often than he would like. The receivers will not be seeing the perfect placement they see in practice. But in Driver they have a shining example of how to make this season work--with a good attitude. Its a bit early to tell, but there are hints of these two rubbing off on their peers. The receivers have spoken in the past of how they so pride themselves in their yards after the catch that they are in constant competition with each other. Recently those numbers have dipped, and they're itching to get them back up. Guess who spearheaded the YAC movement? On the defensive side, last year a unique celebration emerged from the Packers' secondary: the handshake. When asked about the oddity after the game, the younger members of the secondary referred to a road trip as a "business trip," and explained the handshake was their way of finishing their business. I imagine Charles Woodson read the paper the next day with a proud fatherly grin on his face. So we have professional and exuberant. Each have their merits, and both fit their jobs quite nicely. The defense needs discipline to learn a new system while the offense could stand to loosen up a bit. The benefits may not kick in now, but I feel confident in saying this: we'll be seeing the influence of these two men for some time after they're gone. Don't forget about Aaron Rodgers, he may only be in his second year as a starter but he's a fifth year pro and he's immensely popular in the locker room. That's true. I started to mention him, but I'm not sure he's had a chance to make a lasting impression in that time. I can't determine what his imprint will be yet.